This strata was something that I whipped up because we had guests coming to the beach, a loaf of bread getting stale, and some egg whites leftover from the German Chocolate Cake. This is a great recipe to make for company since you assemble it the night before and bake it off in the morning. I didn’t have a recipe for this, so below are just estimates for amounts. I was a little skeptical of whether this would turn out, but it actually turned out great and was a big crowd pleaser. It’s also a great multi-meal option, so while I served it as a breakfast, it would definitely work for lunch or dinner too. Grease a 10×13″ pan with cooking spray. Cut the bread into large bite-sized chunks, and add 1/3 of the bread to the prepared pan. Layer about half of the spinach over the bread, add another 1/3 of bread, the remaining spinach and then the remaining bread. In a large bowl, whisk together the egg whites, eggs, milk, salt, pepper and pesto. 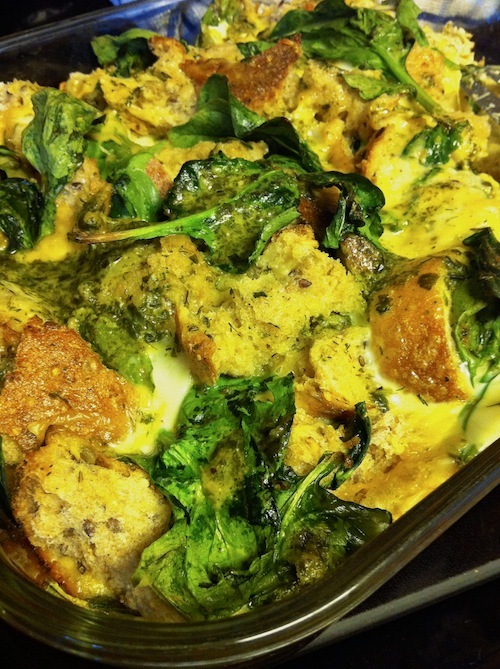 Carefully pour the mixture evenly over the bread and spinach. Cover with cling wrap and refrigerate overnight. In the morning remove the strata from the fridge and preheat the oven to 350°F. Bake for about 30-45 minutes, or until set, a knife inserted into the middle should be mostly dry. If the strata starts to brown too quickly, cover with foil and continue baking until set. This dish is a surprising delight. Highly recommend because it’s sure to be a crowd-pleaser for any meal!